Occupational therapy aims to promote health and wellbeing among individuals and communities. It enables people to participate in the things they want and need to do such as community and family life, work, school, leisure, artistic and sporting interests, and self-care. Occupational therapy is founded on a belief that occupations influence our development and our health and wellbeing, and contribute to our quality of life. Our 'occupations' harness our time and interests, and utilise our personal capacities. Our ability to participate can be impacted by individual determinants such as physical, emotional and developmental issues, and social determinants such as barriers within the social and physical environment. You will develop knowledge and skills to identify the occupational needs of individuals, groups and communities, and develop strategies using occupational and other theories. La Trobe designs its courses with your future career in mind and partners with a range of professional organisations for accreditation and registration. Refer to the detail for each course below to see what professional registration and membership options exist. Graduates may apply to practice in the United Kingdom, North America, Sweden and other countries, subject to each country's registration requirements. Our graduates work in a range of contexts including hospitals, rehabilitation centres, community health services, mental health agencies, health services for older people and children with special need. Other roles adopted by occupational therapy graduates relate to occupational rehabilitation, government/policy, private practice or case / care coordination. 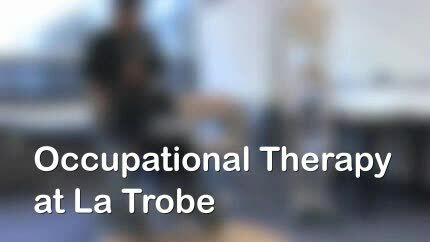 Occupational Therapy is an AHPRA registered profession. In addition, you may apply and register to practice in the United Kingdom, North America, Sweden and other countries (subject to national registration requirements). Duration: 4 years full-time as accelerated (equivalent to 4.5 years full-time study). Some students may take longer.4 year full-time as accelerated (equivalent to 4.5 years full-time study). Some students may take longer. You will complete at least 1000 hours of professional practice learning. In second year you will undertake part-time 'service learning' in a local school or other agency. The majority of fieldwork sits within the third and fourth year of the course. In third year you will complete a four-week full-time placement. In fourth year you will complete two eight-week full-time placement blocks, and a part-time project-based learning placement over 10 weeks. Our professional practice placements occur in contexts such as mental health services, busy acute hospitals, custodial environments, community agencies, schools and rehabilitation centres. You will experience working with people of different ages, recently acquired and long-standing health needs, and interventions that focus on the person, their occupation and the environment. Students at the Albury-Wodonga, Mildura and Shepparton campuses must transfer to the Bendigo campus for the last three years of the course. I always knew I wanted to work in a health field because I love the thought of helping people.